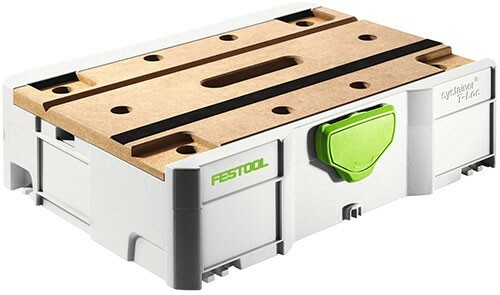 Festool’s new Systainer Worktable features a top that is similar to what they use on their MFT worktables, with holes that work with Festool clamps and hold-downs. 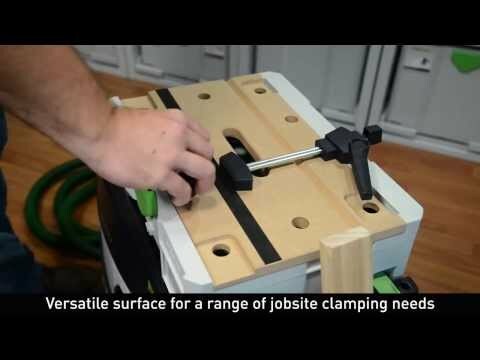 In addition, the top has a v-groove that can be used to secure dowels and pipes. A non-skid strip that is built right into the work surface also does its part to grip your material. To remain compatible with existing Festool products the SYS-MFT is the same height as a regular SYS-1. Despite the thicker MFT lid, the SYS-MFT still opens like a typical T-Loc Systainer and has room inside to hold your clamps and other hold-downs.